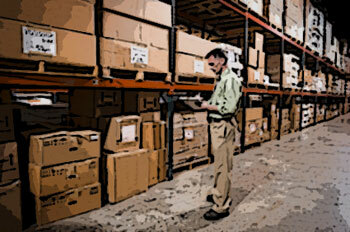 Inventory Accuracy, Cycle Counting, Physical Inventory Consulting Services. My services related to inventory accuracy are among my most popular services. You would be hard pressed to find anyone who has analyzed inventory accuracy to the level that I have. That's clearly evidenced in my first book written back in 2003, where I dedicated over 300 pages to this very important topic. Rather than just focusing on technology, I’ve focused on why we make errors, how to create processes that make it easier to be accurate, how to train employees to be more accurate, how to catch errors before they affect customers, and how to best count inventory. This is how accuracy happens. I take a very practical approach towards inventory accuracy. Typically there are relatively simple and inexpensive things that can be done to reduce or eliminate errors. I work through your processes with you and identify those improvements. In fact, many of my recommendations related to accuracy are seemingly minor changes to processes, but these little changes can make all the difference. Accuracy is in the details. This isn’t to say there is no role for technology in solving accuracy problems. There are numerous technologies that can be very helpful in improving accuracy. However, technology alone can’t solve all your accuracy problems, and improper application of technology not only wastes your money, it may even create additional problems. A key part of my approach relates to the realities and practicalities of business. Though you may be focusing on accuracy at the moment, the reality is accuracy is not the sole objective of your business. In my book on inventory accuracy I repeatedly referred to “what is the best way to do this, that takes into account the customer service, productivity, quality, accuracy, capacity, safety, and financial objectives of our organization?" This balanced approach ensures that you are not constantly going back and forth adjusting processes to sacrifice one objective for the current "priority" objective. As with many of my services, my goal with inventory accuracy is not to simply hand you solutions. I also try to provide an understanding of how these solutions were identified, and in doing so, leave you better prepared to find your own solutions in the future. A cycle	counting program that works. When done right, cycle counting can prove to be a very useful tool in maintaining accurate inventories. However, improperly planned or executed cycle counting programs can actually create inventory problems (very common) and waste valuable labor. In addition, some operations have very serious challenges when it comes to implementing a cycle counting program. This is especially true in 24/7 manufacturing environments where it is often difficult to isolate inventory and transactions to get an accurate count. The “standard cycle counting program” most are familiar with, just doesn’t work that well in many environments. I’ll work with you to develop a count strategy along with counting methods that get you what you need without wasting labor or creating additional problems. And for those who need to do periodic physical inventories, I can help you take the pain and aggravation out of the physical inventory process, and get better overall results from it.